I love Jennifer Donnelly, but I'm not totally sold on this. I like her books partly because they're mostly historical but she's a lovely writer so I'll definitely check this out. I love mermaids, and I think this sounds pretty awesome. Also beautiful cover. I agree, that cover is gorgeous. I'm a big fan of the color green (it is my favorite color) and that particular shade is so pretty! :) I haven't really read a book about mermaids yet. I hope you'll find yourself enjoying reading this one. 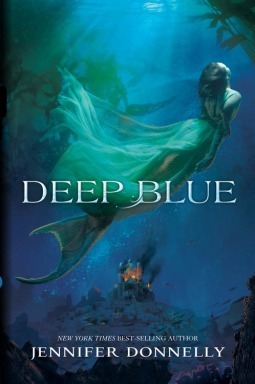 This sounds really good and I love the cover :) Mermaid books are always great. Nice pick! Ohhh I'm not usually one for mermaid reads but this one sounds really intriguing and I love the cover. Think ill have to pick this one up and try it- thanks for sharing! I have an ARC of this one! :D I can't wait to read it. I might be up for a good mermaid tale (no pun intended). Here's my WOW. Love the cover! and the story sounds interesting. thanks for sharing. I really want to read this one too. Great choice. I'm not that big on mermaid books but this sounds like it might be good. Yeah, not completely sold though I do like this cover. Very pretty! This is something i wouldnt read but i hope you enjoy it! I haven't read any of her other works, but I've heard nothing but great things and since this is about mermaids I'm super excited! Great pick! Awesome pick! My local indie bookstore pass this one on to me. Excited to read it! I do love Jennifer Donnelly's historical fiction, and so never would have expected a book like this out of her. But I have to say, just the idea of her writing something so seemingly out of character for her, gets me excited. I know what you mean, this seems so unlike her historical fiction books that I'm a bit unsure about it. I'll be curious to read some early reviews to see what people think.